With all the fascinating findings to come out of behavioural economics and social psychology in recent times, it does surprise me that their utilization is still not common practice in areas such as business and government. Surely if these institutions invested in understanding the psychology of their customers or the public, they would be more effective in changing the behaviour of these groups? After spending some time exploring these fields, it has become a bit clearer to me as to why this transformation has yet to get out of first gear. The tight grip that standard economics still holds is definitely half the answer. The other half however I think is due to something a bit deeper, a sort of stubborn delusion that naturally makes it hard for people to accept the effects seemingly trivial contextual cues have on their decisions. This sense of self-autonomy is not a narrative that is easily changed, as I think adjusting it exposes people to a level of perceived vulnerability that they aren’t comfortable with. Especially as ideas such as freedom, liberation and independence hold such high stances in modern society. However, this does seem to be slowly changing, especially in more developed parts of the world such as the United Kingdom, the States and Australia, where academics, impresarios and practitioners are starting to build conversations and stories around behavioural thinking and its application in business and government. The stories that have foundations in real life practical examples are the ones that are carrying this way of thinking forwards, and with such emphatic results appearing in the last few years, in areas from energy conservation to organ donations, I am optimistic about the future relevance of these fields. Inspired by the practical examples that are starting to appear all around the world, something we like to create at Gravity, are what we call “Side Nudges”. These are small practical experiments we do as side projects to test the ideas we come across in the behavioural economics or social psychology literature in real life settings. A great Side Nudge we did earlier on this year was with our local coffee shop. 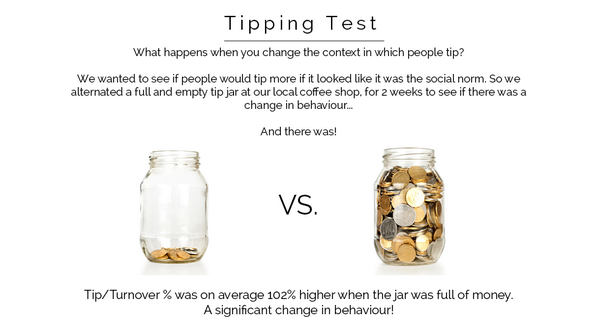 The experiment was to see if people were more likely to tip, if the act of tipping was seen as a social norm in a particular context. We did this by alternating a full and empty tip jar at the till where customers pay, every day for two weeks. The full tip jar comprised of a combination of one, two and five Rand coins, as well as ten, twenty rand notes. The employees would record the organic tip amount at the end of everyday along with the turnover that was made. At the end of the two week period, we went and collected the results and to our surprise there was a really significant increase in tipping when the jar was full. The tip/turnover ratio was on average 102% higher on the days that tip jar was full. The test was obviously not large enough to conclude anything close to pure causation, but it was interesting nonetheless. The value in doing these small experimental ‘Side Nudges’ is that they push us to think creatively about how we can apply the findings and ideas that are coming out of behavioural science, which in turn leads to continuous improvement of our service offering. Besides this, the experiments also act as incredibly powerful stories that help in expressing the value of the behavioural approach and getting around its seemingly counter-intuitive position.